Originally published in 1995, this is the first book of our series of four books that explore the subject of biblical mythology. 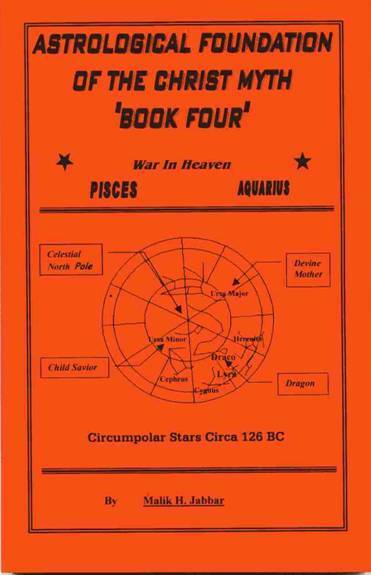 The basis of biblical mythology is astronomy and because astronomy is a somewhat complex study, we have chosen a graduated process of exploring the topic through 4 volumes published over time. Each Volume explores the subject with increased focus into the intricate complexities of esoteric biblical symbolism. "Book One" contains in it's Appendix valuable astronomical reference data that is not presented in the later volumes. This data is Key to tracing the symbolical biblical correlations that are explained in all four volumes. All mythology is related to astronomy and cycles of time. This is innately connected with seasonal cycles and agriculture. Without doubt, the early formation of religious philosophy (mythology) was inextricably connected and actually based on these cycles of Time and the environment. This book was published in 1997. Our research has expanded (in this book) into subjects not covered in "Book One" and we go into greater detail in our effort to clearly explain the scientific astronomical correlations that are symbolically rendered in religion. The Bible is our Common Reference Book, focus, Hub and Sounding Board through which we prove our esoteric interpretations. We are able to bring vivid clarity to biblical symbolism, by referencing certain key biblical verses and proving their astronomical correlations. Graphics are used to help prove this presentation of facts. This book was published in 2001. It contains All New information that was not presented in "Books One and Two". Our explorations into the esoteric symbolisms of biblical mythology has been significantly intensified within "Book Three". The four major categories by which mythology is defined are Lunar, Solar, Stellar, and Environmental. Our earlier books have focused mostly on the Lunar and Solar symbolism, but "Book Three" brings the Stellar symbolism more into Focus. This sets the stage for Book Four (not yet published) which shall focus on the interfacing of the three cosmic categories of biblical symbolism, which is essential to the Unveiling of that which is thought to be most Arcane within the bible. 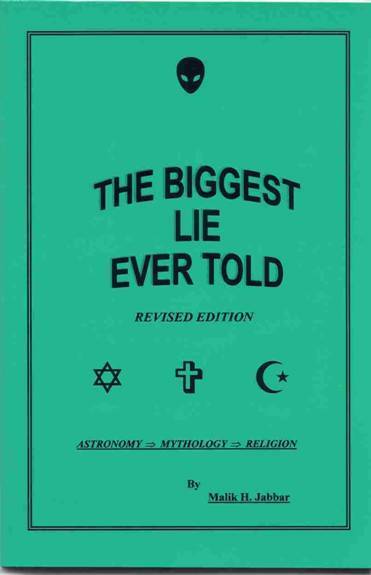 This little book “The Biggest Lie Ever Told” was published in September of 2002 - it is the first book that I wrote on the subject of Religion/Mythology. I wrote this book early in my writing career and this is the Third Printing of the book. I feel that the book is a good primer for those entering into the arena of secular theological research. In this book, I attempt to explain the evolution of religion from primitive times to the present. The emphasis is on a rational evaluation of mankind's spiritual evolution, from the fear and worship of nature i.e. the tendency of primordial man to assign unseen spirits and demons as the controllers of the forces of nature; and how the rituals enacted to serve and appease these fanciful deities overtime evolved into our modern religious rituals. This is the Fourth Edition of this book “The Biggest Lie Ever Told”. The book has been extensively revised and enhanced. This edition of the book contains more than twice the content of the previous volume. Much of the commentary has been diligently refined pursuant to greater clarity. We have also added a great deal of information relevant to religious esotericism and mythology that was not included in the previous volumes. The purpose of this book is to serve as a primer for those entering into the arena of Secular Theological Research; and what is Secular Theological Research – it is research based on reason and facts, governed by scientific methods of investigation, and not influenced by popular opinions or favored dogmas. Secular Theologists are not guided by faith in any particular creed, but rather follow paths charted by reason and pragmatism. They are investigators first and believers or nonbelievers second, depending on the prevailing winds of reasonable evidences or lack thereof. Secular Theologists do not accept the concepts of so-called godly revelations, or sacred scriptures – to do so would be tantamount to exempting said sacred scriptures from our critical examinations, because such documents (scriptures) would be deemed inviolable by reason of their so-called sacred sources; therefore the word “sacred” does not exist in the working vocabulary of Secular Theologists. All scriptures from all religions are viewed with equal skepticism, and are judged worthy or unworthy solely as dictated by the yardsticks of truth; and truth, as you know, tends to be reasonable, logical, plausible, and oftentimes verifiable when researched. This book contains all the information that was listed in the previous volume, plus much more, as I have indicated above. The interconnections between religion and mythology are explored extensively; also the various cultural and earthly environmental affects that influenced mankind’s attitudes or conceptions of god are examined in vivid detail. Special discount on Package Buy of all 6 Titles - $58.18 plus shipping! We accept MasterCard, Visa, and Amex! 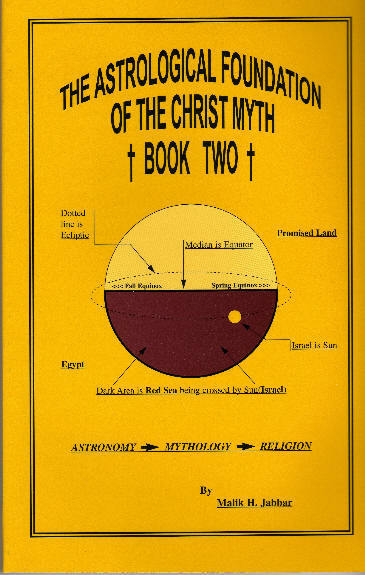 Receive 1 copy each: "The Astrological Foundation Of The Christ Myth" - Books 1, 2, 3, & 4; 1 copy of "The Biggest Lie Ever Told 4th Edition" & 1 copy of "Lifting The Gnostic Veil"
THE FOLLOWING IS AN EXCERPT from “The Astrological Foundation Of The Christ Myth, Book One” Chapter One, The Celestial Womb------ According to the bible , Mankind was created in the Image of God. This poses a very interesting question as to the descriptive Appearance of God. If we are, indeed, fashioned in the Image of God, does this mean therefore, that God is Man, or does He (God) have the Appearance of Man.? Now , if we envision God in the Likeness of Man, does this include human frailties? We, as humans, are Dependent upon the universe for our survival. We can not exist without , Fire, Earth, Air and Water. Is it possible that the Creator God could be likewise dependent upon the Elements. Let us review the bible verses concerning Creation: Gen 1:26 And God said, Let us make man in our image, after our likeness: and let them have dominion over the fish of the sea, and over the fowl of the air, and over the cattle, and over all the earth, and over every creeping thing that creepeth upon the earth. Gen. 1:27 So God created man in his own image, in the image of God created he him; male and female created he them. These verses are unequivocal and clear., And according to these verses, We look like God and have the Characteristics of God almighty. We have his Image , see definition of the word Image, im·age (¹m“¹j) n. 1. A reproduction of the form of a person or an object, especially a sculptured likeness. 2. Physics. An optically formed duplicate, counterpart, or other representative reproduction of an object, especially an optical reproduction of an object formed by a lens or mirror. 3. One that closely or exactly resembles another; a double: He is the image of his uncle. And we have his Likeness, see definition of this word Likeness from my American Heritage Dictionary, like·ness (lºk“n¹s) n. 1. The state, quality, or fact of being like; resemblance. 2. An imitative appearance; a semblance. 3. A pictorial, graphic, or sculptured representation of something; an image. ———————————————————— SYNONYMS: likeness, similarity, similitude, resemblance, analogy, affinity. These nouns denote agreement or conformity, as in character, nature, or appearance between persons or things. Likeness implies close agreement: I am not making a play on words. These definitions (from the American Heritage Dictionary) get to the heart of what these verses actually mean, in Genesis. These two words , Image and Likeness , define not only appearance but even the Nature and Quality of the Creation(Image). Can you imagine the Creator God, being subject to the same needs, weaknesses, and limitations that we endure. I most certainly can not. Some say that our likeness to God refers to the spirit and not to flesh. This English word Spirit is derived from the Latin, spiritus, which means breath or to breathe, the act of inhaling and exhaling. So what are we saying, that God breathes as we do? Again, are we making God dependent upon a product of his creation , that is to say air , which is the vital constituent of human respiration? Let us define the word spiritual, which may be more on target to defining the Godly Image which some say we are created after. spir·i·tu·al (sp¹r“¹-ch›-…l) adj. 1. Of, relating to, consisting of, or having the nature of spirit; not tangible or material. See Synonyms at immaterial. 2. Of, concerned with, or affecting the soul. 3. Of, from, or relating to God; deific. 4. Of or belonging to a church or religion; sacred. 5. Relating to or having the nature of spirits or a spirit; supernatural. This word spiritual seems to indicate that which is unseen and immaterial, unearthly, that which relates to our soul, and what is a Soul? Again, let me present another definition from my American Heritage Dictionary, soul (s½l) n. 1. The animating and vital principle in human beings, credited with the faculties of thought, action, and emotion and often conceived as an immaterial entity. 2. The spiritual nature of human beings, regarded as immortal, separable from the body at death, and susceptible to happiness or misery in a future state. 3. The disembodied spirit of a dead human being; a shade. Take note that the definition of the word , soul, goes to our actions , our thoughts, our emotions .This is very interesting. Should we conclude that our emotional makeup is an accurate reflection of Gods demeanor? Could God possibly be subject to the same emotional hangups as we? Please remember, we are trying to determine through a system of questions and analysis, exactly what it means to be created in the Image of God. If we conclude that we are the spiritual image of God, but not the physical image ,we end up with a real Pandora's Box. Without doubt, the state of today's world reflects spiritual corruption , in every facet of life. The spirit seems to be subject to the same or similar temptations and weaknesses as the flesh. Mat 26:41 Watch and pray, that ye enter not into temptation: the spirit indeed is willing, but the flesh is weak. Eph 6:12 For we wrestle not against flesh and blood, but against principalities, against powers, against the rulers of the darkness of this world, against spiritual wickedness in high places. Without doubt, we possess a spirit , which is corruptible. Can this be a true reflection of God's Image? I think we could go on for hundreds of pages, trying to explain with accuracy, in what manner mankind , was created in the image of God, and not come to a definitive solution; That is , if we try to make our conclusion agree with traditional Western religious precepts. As, with many of our commonly accepted religious concepts., our traditional beliefs and understandings of being created in the Image of God are in Error. I have gone through this brief litany of the most commonly held interpretations , concerning the image and likeness , in which we were created, for the purpose of exposing the artificiality of our most popular concepts on this matter. Being created in the Image of God does not mean, what most of us have believed throughout our lives. When the Ancients wrote that we were created in God's Image, they were propounding a hypotheses based on human correlations to the Cosmos. Correlations that are Exact to the smallest detail. Many thousands of years ago, at the dawn of history, if there is really such a time as a dawn to history, The Ancients discovered undeniable correlations between the biology of the human species and the movements of celestial bodies within the stellar and solar universe. Correlations proportionately related in Time(duration) and Chronology(sequence) of Time. These correlations exist between the human species and the total universe , inclusive of the solar system , and of the Solar system to the expanded universe(infinity) The Ancients saw the universe and their immediate environment as well as the capacities embodied within their own intellect as the most trustworthy representations of the Creator God. The Universe(terrestrial and celestial) appeared to our ancestors as the only authentic image of the Father. The Cosmos was undoubtedly His Handiwork, and We , the Human creation was likewise the Handiwork of the Almighty. In consequence , when our fathers discovered that they were indeed biologically and chronologically correlated to the Cosmos, they transposed this knowledge to the written word and language as, We(humanity) are created in the Image and the Likeness of God. One of the most noticeable correlations involves the life and light cycles of the female species of mankind to the moon. They discovered that the life(menstrual) cycle of the woman ran 28 days in correspondence with the light (phase) cycle of the moon, which also runs at 28 day intervals. They noticed likewise that the phases of the woman's' cycle and the moon's cycle were relational. The New moon begins in darkness and waxes to it's Fullness at 14 days(midway through the cycle of light).. When the moon reaches it's fullness , after 14 days of growth(waxing), it then commences to discharge it's light so that by the end of the 28 day period all light has been shed(flushed) from it's celestial body. The life (menses) cycle of the woman likewise begins in darkness(undeveloped). At the beginning of the cycle(out of darkness, i.e. undeveloped) the egg begins to grow within the ovary until it reaches maturity(fullness) at 14 days, at which point it (the egg) is released and flows toward the uterus from whence it shall be discharged(shed) from the body. If the egg is fertilized , it shall be discharged after an appointed time (280 days, the natural period of human gestation) as a new individual. If the egg is not fertilized , it shall be discharged in one tenth of the appointed time(28 days, the natural period of human menstruation) as the dead remains of a once fertile germ of life(light). The ancients also observed that the human body did not reach fullness in physical and intellectual potential till approximately eighteen years after birth. They reasoned that eighteen years seemed to represent a complete cycle of life , from birth to Adulthood. Likewise the moon, which they associated with the 28 day life cycle took a little over eighteen years to complete the cycle of it's Nodes. The Node represents the point of intersection of the Moon with the ecliptic(the apparent path of the sun around the earth), both north(Caput Draconis) and south(Cauda Draconis). It takes the Moon a little more than eighteen and a half years to complete this cycle(revolution), and restart anew, from it's original point of commencement. To complete a cycle is the same as reaching maturity. Both terms indicate a coming into fulfillment. The Ancients studied even further into the relational parallels between the human species and the solar system. Within the chronology of the Solar System, they found analogies , that can only be described as astounding and categorically conclusive in proving the correlative link between humanity(the microcosm) and the universe(the macrocosm). 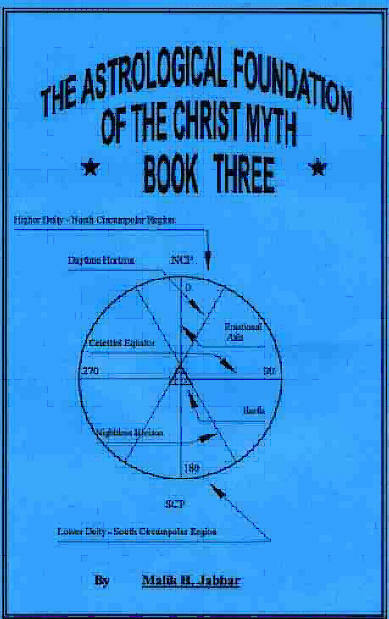 At this point , we shall explore a corellation that has direct bearings to the astrological(astronomical) foundations of the Christ Myth. Humanity has , since time immemorial looked upon December 25, as the birth of the Sun(Son) God. Witness a quote from my previous book " The Biggest Lie Ever Told". As I stated at the beginning of this chapter, the key to the connection between the Sun God and the Son of God is the number 3. The bible is replete with verses stating that the major sign for identifying the Son of God is that he would lay in a grave for three (3) days and then be resurrected-BORN AGAIN. Jesus Christ is the Personification of the Sun-God. I will not delve into the subject, at this point, but if you searched from now till doom's day, you will not find any SECULAR HISTORY of a person living 2,000 years ago, in Palestine, by the name of Jesus Christ, that accomplished the feats that are attributed to him, in the bible. The source of all knowledge concerning a person (prophet) called the Christ or Jesus are the biblical scriptures and other literature that was derived from the original biblical sources. Furthermore the bible was compiled and translated and revised by proponents of the Christian faith who established that religion, during the early centuries of this era (this era began approximately 2,000 years ago). The PRE-CHRISTIAN EUROPEANS practiced a variety of paganistic rituals that culminated each year, at the dawning of the winter type weather, on Dec. 25. They celebrated this day as the day of the Birth or Resurrection of the Sun God. Not as a symbol. They actually looked upon Dec. 25 as the day when the Sun was Born anew- Resurrected into new life. This ritual worship of the resurrection (birth) of the Sun-God on Dec. 25 goes back thousands of years into pre-history. The primary, motivating factor that inspired early man to worship god, was his fear and dread of the potential fierceness of his environment. His ( primitive man) major impetus for worshipping and sacrificing to the Sun God was to assure that the Sun God would continue protecting mankind from the ravages of the dreaded winter. So for primitive man, the inception of winter, DEC 22, was the worst day of every year for him. This day (DEC 22, the start of winter) marked the beginning of the worst stage of his yearly struggle for survival. This day (DEC 22, the start of winter) was the harbinger of his potential perdition. This day DEC 22, is referred to by astronomers as the Winter Solstice. This word, Solstice, according to Websters Dictionary means "to stand still, pause, a turning point". On DEC 22 of each year, the Sun reached its Winter Solstice, the lowest point of trajectory(angle of rays) of the entire year. After DEC 22 (the turning point), the Sun again Rises northward, which is a sign that summer shall come again! Even though DEC 22 marks the beginning of winter and the weather turns progressively worst from that point (DEC 22) until the start of spring (March 21), all is not lost. Because the fact that the angle of Sun's rays projecting on the earth, was moving progressively northward told early man that the Warmth and Comfort of the summer Sun would eventually prevail. But there was a period of doubt, for early primitive civilization. Primitive man did not understand our universe and solar system as we do today. We, today, know exactly what causes the four seasons of the year. But early man did not. He did not possess knowledge of our solar system, the axis of the earth--it's rotation and revolving around the sun. He did not understand that these forces operated by a Natural, Providential Law, that would stay it's course, no matter what. Early man only understood the result, not the cause. So each year, early society awaited the approach of DEC 22, with foreboding. DEC 22, the day of the Winter Solstice (definition is to stand still) was a day of reckoning for them. Because it seemed to them, as they observed and tracked the North to South movement of the Sun, that on this day DEC 22, the sun entered its grave. The North to South progression of the Sun can be likened to a swinging pendulum. You know that when a pendulum reaches its solstice (the point where it swings back - its turning point),that for a slight imperceptible moment, it actually stands still. But in terms of our vast solar system, the point of solstice is not imperceptible. It lasts for days, three days to be exact. For three days, after the sun reaches its solstice, it appears to stand still. This period of pause, between the Suns descent and ASCENT, wrought paralyzing dread and fear into the hearts and minds of the early pre-Christians. Over TIME, they established rituals and traditions concerning this period (DEC 22 to DEC 25). They passed the word through oral tradition, and eventually, after their societies established writing, wrote it down, concerning their Sun God: the sun shall lay in a grave (point of solstice) for 3 days. But after 3 days the sun shall rise, be resurrected, (according to Websters dictionary, the word resurrect is linked to the word resurge, which means To Rise Again, to revive), and ascend toward heaven, (progressively ascend northward to the position of the summer sun). And when the sun completes its ascent upward toward the point of its summer solstice, it will comfort us and bless us with warm weather and long days and will save us (be a savior) from the ravages of winter. So, this, that I have explained to you here, is the ORIGINAL, authentic, true CONCEPT of the resurrection. 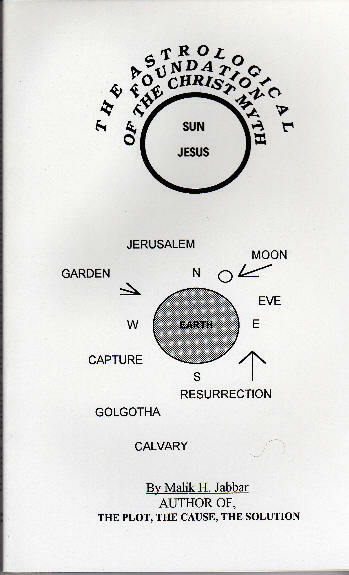 When the pre-Christians spoke and wrote of the resurrection of the Sun; they meant exactly that. It did not refer to a person, but to the SOLAR SUN. But, when the priesthood founded and established Christianity, they changed the Sun to Son. The priesthood told the pagans that the SON (Christ) was born on DEC 25, just like their SUN. They told them that the Son had been dead in a grave for three days and then was resurrected (revived) and ascended to heaven (upward),just like their Sun. As stated in this excerpt from my other book, the reverence for December 25, as the Day of Birth for the Sun(Son of God) goes back into pre-history. The hollowed reckoning for this day did not begin two thousand years ago with the Christ. Jesus Christ, so called , was simply the latest personage to be linked to this ancient date of December 25, depicted as the birth of the Sun God. Some of the others that were revered on this day are as follows: Krishna, of India, born on December 25, his mother was a virgin, mother's name was Maia . The name Krishna means Black or Dark. His uncle , Kamsa, the ruler at the time of his birth sought to kill him(Krishna) because he had heard a Prophecy that Krishna would overthrow him. Krishna escaped death by being smuggled out of the area to safety. Mithra, of Persia , born on December 25, his birth was witnessed by Shepherds that brought gifts to honor him. He was styled as a Mediator between God and Man. Witness this quote from my Encyclopedia Encarta, Mithraism was similar to Christianity in many respects, for example, in the ideals of humility and brotherly love, baptism, the rite of communion, the use of holy water, the adoration of the shepherds at Mithra's birth, the adoption of Sundays and of December 25 (Mithra's birthday) as holy days, and the belief in the immortality of the soul, the last judgment, and the resurrection. Mithraism differed from Christianity in the exclusion of women from its ceremonies and in its willingness to compromise with polytheism. The similarities, however, made possible the easy conversion of its followers to Christian doctrine. "Mithraism," Microsoft (R) Encarta. Copyright (c) 1994 Microsoft Corporation. Copyright (c) 1994 Funk & Wagnall's Corporation. Horus, of Egypt, born on December 25. His mother, Isis , gave birth to him in the swamp, she was warned by the god Thoth, to flee and conceal the child from the evil Set. Set had killed the father of Horus, whose name was Osirus, and sought to kill Horus, also. Isis was able to keep Horus hidden from Set, till he (Horus) grew to manhood. Horus sought to avenge the murder of his Father, and made war against Set , and defeated him. Buddha, of India, born on December 25, his mother's name was Maya, she was a virgin. He was immaculately conceived, and at birth , he announced that he was a savior to the world. His birth was announced by a star. At his birth, he was visited by Wise Men who declared that they had seen Signs of his birth, that is to say , signs of the royal birth . Beddou(Fot), was a god of the orient born 1027 BC, his mother was a virgin, he was born of royal blood. The king sought to kill him at birth, because he felt the newborn infant posed a future threat to his Throne. The god child was saved by shepherds, and lived in the desert till he reached the age of thirty, at which time he commenced teaching his spiritual doctrine to that region. Quetzalcoatl, a god the Western Hemisphere , was born of a virgin. He sojourned in the wilderness, fasted forty days. Was crucified. He was variously represented as the God of light that struggled against the god of darkness called Tezcatlipoca. Hercules, son of the god Zeus, predestined by birth to inherit the throne of Argos. Hera, the jealous wife of Zeus desired the throne for another and sought to delay the birth of Hercules, and subsequently tried to kill Hercules while in his crib , by sending two snakes to strangle him. Hercules killed the snakes, though he was less than a year old. Later, He was sent away to the countryside where he became a shepherd. Attis, of Phrygia , His mother was a virgin, her name was Nana. He was a shepherd, and reported to have died by self emasculation under a pine tree. He was alleged to have risen from the dead at Easter i.e. The vernal Equinox. Tammuz. hailed as the only begotten son of the god Ea. His mother was a virgin , by the name of Ishtar. As an infant he was hidden in a chest by Aphrodite, the goddess of love and entrusted to Persephone, the goddess of the nether world. Persephone later opened the chest , and was so stricken by the beauty of the babe, that she refused to return the child to Aphrodite. The two goddesses fought each other for possession of the child, till finally the god Zeus mediated the matter, and declared that the child shall spend half it's year with Aphrodite and the other half in the nether world with Persephone. There were many, many more gods and saviors born of virgin mothers, than I have listed here. To explore this subject in detail, read The World's Saviors, by Charles Vail - The Worlds Sixteen Crucified Saviors, by Kersey Graves, and The Golden Bough, by George Frazer. The fact that so many saviors were alleged to have been born on the same day of the year, under the same and similar circumstances, in vastly scattered locations of the world, throughout thousands of years of history, indicates a worldwide dissemination of a common mythology. The sameness of these various myths that are widely separated geographically and in language and racial affiliation indicates an extremely ancient source as well as a coalescence of thought and philosophy within the ancient world that, perhaps many of us had not envisioned. Indeed ancient society was evidently nourished from the same spiritual fountain(Religious Philosophy). We see , that over the millennium, minor superficial descriptive differences have entered the ancient Myths, But nevertheless we can easily recognize the original core that pervades all of the various tales. We should not assume that all people from the various regions of the world possessed the same interpretation of this symbolism. Nor should we assume that all the people within any given society, at the various strata(levels) of which all societies are layered possessed the same interpretation of this allegory. It is evident that the ancient sages, in their wisdom, devised a very refined and uniquely adaptable religious system that was distinctively compatible to an individuals level of understanding. Our religious philosophy of this era is directly descended from the Mythical allegories of the ancient world. The process by which ancient myth evolved into contemporary religion can be described as follows, Witness quote from my previous book, The Biggest Lie Ever Told # 1-In the beginning there was REALITY(primitive people surrounded by a hostile environment with no scientific , developed understanding of their predicament) which led to #2-MYTH, the fanciful CREATION,(caused by a lack of intellectual development)of Gods and Demons as the Controllers of the Forces and Elements within their environment. To #3-RITUALISM (the establishment of rituals and sacrifices to appease or please their imagined deities and demons). To #4-TRADITION ( the continued reverence of outmoded rituals and customs by a society where scientific knowledge has increased to the point that they should know better, but continue the paganistic practices anyway, because of an Ingrained Mentality cultivated over the millennia and habitually perpetuated). To #5 MODERN Organized (the establishment) Religion. the political ,financial, religious leadership alliance that finds it to their advantage to perpetuate the ignorance of the laity for purposes of control, organization, defense, aggression, and the accumulation and protection of their (leadership)wealth. This process of religious evolution described in my previous book reflects the perspective of the laity, and the intellectuals , but not of the Priesthood........ All of the Saviors listed above , including Jesus can be refered to as Solar Gods, Gods of the Sun. In other words, their Births, lives, and Deaths can be correlated to the Transit Cycles of the Sun. When the ancients formulated their religious beliefs, they used the Image of the creator God(that is to say the Cosmos) as their pattern. They Personified the elements of the Cosmos, and recorded the movements of the stars and planets as personified deities and demons. They conjured fables and tales that hold exact correlation to the planetary(includes all elements of the universe) movements within the celestial heavens. We are now ready to explain why all of the ancient saviors mentioned earlier were alleged to have been born on December 25. In astronomy/astrology , the beginning of cycles, that is to say, the Conception of a cycle is determined by a Conjunction, the point where elements of the universe Intersect, or Pivot , or Join, or Come together, or Cross paths, or Occult each other. The moon cycle begins at the new moon, the point at which the path of the moon around the earth intersects between the sun and the earth. This point of Conjunction commences a new moon cycle. The summer cycle begins when the Sun reaches it's highest point in the celestial heavens at 23 1/2 degrees north declination, and pivots so as to retreat southward toward it's Fall. Thus, a Pivotal point commences a new cycle. The Fall cycle (autumn) begins when the ecliptic of the sun crosses the celestial equator in the west. This point of intersection is the Genesis for fall type weather, a seasonal change. Thus this Crossing commences a new cycle. The Winter cycle takes control when the sun bottoms out at it's lowest point south of the celestial equator and pivots so as to return to it's former position. Thus , the struggle of the sun to regain that(position) which was lost is the dawn of a new cycle. And the Cycle which the Ancients saw as the greatest of all, was the cycle of the new year. The point and time at which the ecliptic of the Sun intersects the celestial equator at the Vernal Equinox. This date March 21, was traditionally the commencement of the New Year. In ancient times , as well as today, they celebrated the victory of the Sun over the forces of the nether world, the Sun's emergence into it's glory by defeating the powers of the great Typhon, that evil serpent that lurked and prowled in the perilous celestial waters , beneath the celestial equator. This point of crossing at the vernal equinox was the forecaster of new life, of Spring, fresh vegetation, greenery and relief from the oppressions of winter. It was the time , or beginning of the time(season) to plant new seed under the bosom of the earth, to Impregnate her, so that she may bring forth new life in her time. But not only did man Impregnate the soil of the earth by implanting her with his seed, the ancients surmised that the SUN, on this date of March 21, was indeed Impregnating the Cosmos with the Seed of Life for a New Sun, an Heir to His Throne of Glory. On this date , March 21(the beginning of spring), the ancients saw(perceived) the celestial Sun(God the Father) Impregnating the Cosmos(Virgin Mother) with the Sperm of Life(Rejuvenating Element) that would one day produce a New Sun(A Savior, A Christ) to replace and Renew the Kingdom of the Sun, once this present Sun's time had passed. Isa 9:6 For unto us a child is born, unto us a son is given: and the government shall be upon his shoulder: and his name shall be called Wonderful, Counsellor, The mighty God, The everlasting Father, The Prince of Peace. This prophecy from Isaiah , of the bible , did not refer to an actual human god. The ancients wrote metaphorically, in order to shield the Gnosis, and for other reasons. They were referring to the birth of the Actual Sun, The Ruler(God) of the solar system. This prophesied Son of God(the Sun) whose Egg of Life was Fertilized at the Vernal Equinox of March 21, when his Father(the Sun, it's ecliptic) , in all his Glory Conjugated with the celestial equator. This date, March 21( the beginning of spring), marked the commencement of the period of Gestation for the future Savior(Sun) of the World. We know that human gestation last for 280 days and so it is also, with the Sun God. The period of Gestation for the Macrocosm(Celestial Sun-God) is the same as his Microcosm(Created Image) I.E. the Son Of God, as well as the human species in total. Let us Count the days leading from March 21(the vernal equinox) to see where 280 days will take us - 11 days(Including March 21) brings us to the end of March, now we must add 30 days for April, 31 for May, 30 for June, 31 for July, 31 for August, 30 for September, 31 for October, 30 for November, and let's try 25 for December. That adds up to 280 days! Now, we can easily see that Jesus Christ and all of the Saviors listed above were Born Right On Time, three days after the winter solstice, at the stroke of midnight on December 25th. The evidence is clear that the Prophecy of the Birth of a Coming Savior was Astronomical , in Origin. The ancient Sages personified(gave human names and characteristics) the elements of the Cosmos, in order to produce a Theology(Mythology) that was intellectually compatible to every level of human society, preservable throughout history, because of it's Esoteric quality, and soundly based on Natural(Godly) Truth. Copyright © 1999 [Rare Books Distrubutor]. All rights reserved.